Bad breath, or halitosis, can be a major problem and quite disturbing when speaking with friends or giving a kiss to your beloved one. It can occur on occasion, or it can be a chronic condition. But we have good news: halitosis can often be prevented with some simple steps. 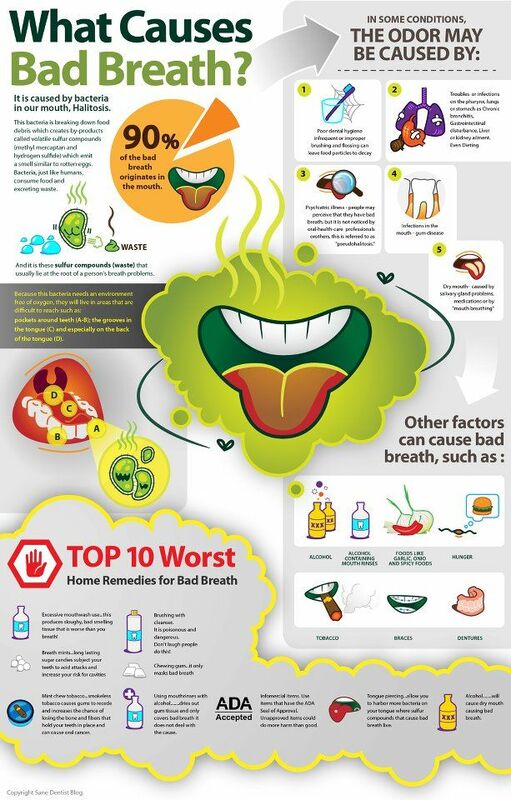 Bad breath is caused by odor-producing bacteria that grow in the mouth. When you don’t brush and floss regularly, bacteria accumulate on the bits of food left in your mouth and between your teeth. The sulfur compounds released by these bacteria make your breath smell. Bacteria on the surface of the tongue convert amino acids forming proteins into sulfur compounds, during the process of digestion. It may cause bad breath. After consuming high protein foods, there is a greater chance of bad breath. The growth of bacteria is promoted by dead cells, scrapings, and insufficient salivation in the oral cavity, that lead to halitosis. How to diagnose bad breath? It may often occur, that the patient is so accustomed to his own odor, that he/she does not notice bad breath. The diagnosis of chronic halitosis can be set up using a so-called halimeter. The halimeter measures the concentration of sulfide molecules in exhaled air and saliva. The measurement lasts for less than a minute, which must be repeated three times. How can be bad breath treated? Brush twice and floss teeth daily. Remember to brush the tongue, too. Mouthwash may temporarily mask bad breath odors, but it may not treat the underlying cause.